Modified bitumen roofing is a form of membrane flat roofing. It is an evolution of asphalt roofing, and is easy to install compared to the older style of tar and gravel. Modified bitumen is compatible with petroleum, and so it is possible that it could be installed overtop of an existing tar roof (unlike rubber flat roofing, which would be eaten away.) Modified bitumen roofing is also very rugged and can sustain a fair amount of foot traffic. There are two main forms of modified bitumen roofing installation: the torch-down installation method, and a peel-and-stick installation. 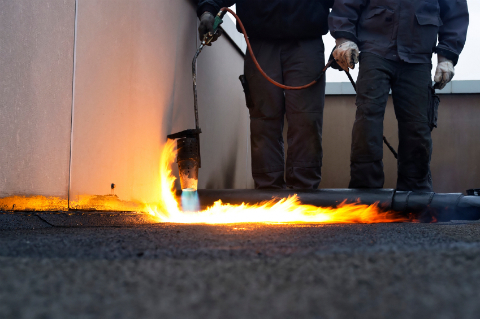 Due to the inherent danger of fire, especially around felting and petroleum products, the torch-down method of installation for modified bitumen roofing should only be performed by a qualified roofer. Ensure your flat roof is entirely clear of debris. Install heavy roofing felt with overtop your decking, old roof or insulation. Using cap nails, secure the felt in rows along the top and bottom of the sheets, as well as a row in the middle. Install drip edge flashing, and apply a primer so the roofing will adhere to it. Roll out a sheet of roofing, allowing an overhang of a few inches on the side of your roof. Cut the roofing, allowing again a few inches overhang. Adjust the roofing so it overhangs the flashing by a half inch, and ensure the roofing is perfectly flat. Then carefully roll the roofing back up tightly, half way. Wearing heavy gloves and long sleeves, turn on the propane torch. Run the tip of the flame along the crease between the roofing felt and the roofing roll. Once you see bubbles forming, gently roll the roofing forward with your foot to install. Align the next sheet of modified bitumen roofing so it covers the edge of the first sheet by a few inches, and repeat the process. Use your foot and gloved hand to press the seam between the two sheets, ensuring a tight seal. A bit of melted bitumen should ooze out along the joint. Repeat the process for the rest of your flat roof. Peel-and-stick modified bitumen roofing installation is more suitable for a DIY job, as there is no danger of fire and no fumes to contend with. The beginning of a peel-and-stick installation starts out the same as the torch-down. Start the process after step 5. Remove the adhesive film, and carefully roll the roofing back into place. Smooth the material out before permanently adhering to your flat roof. Continue this process over the entire span of your rooftop, with an overlap of at least six inches. Using a weighted roller, roll over the entire surface of your roof, paying particular attention to the overlap. Seal the edges of the modified bitumen roofing with roofing cement, and roll the sheets thoroughly to seal the layers together.